Purchased this a a gift. Recipient love it! 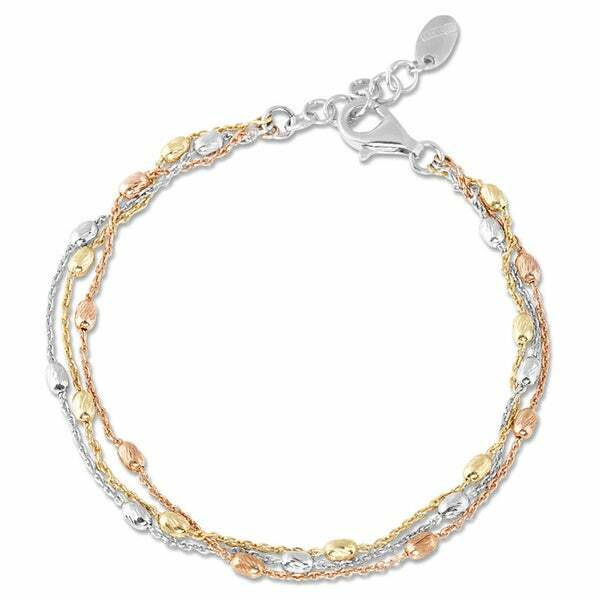 This��Sterling Silver 3-strand Oval Beads Bracelet will add color and shine to any wardrobe. With a high polish finish, this bracelet features oval metal beads add unique details to this stunning jewelry and secure with a lobster claw clasp. I love this tri color sterling silver bracelet. The three colors on one bracelet is lovely , I can wear any jewelry piece I own with it. Gold, silver or rose colors are all very attractive. 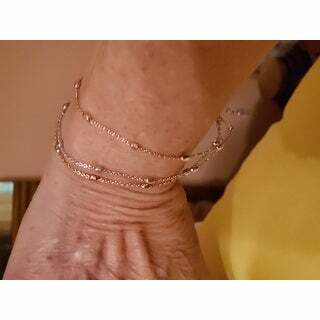 It is a delicate bracelet but the three strands make it more stable. The Sterling silver under the colored strands give the bracelet some weight. I purchased some tri colored earnings to go with the bracelet so I’m all set with the holidays!!!! I purchased this for my 13 year old daughter and she loved it. Pretty nice for the price. Very nice looking with any outfit. I recommend buying this bracelet if you like sterling silver. A very delicate bracelet. Love the strands of silver. I got this for my niece who received and revise all the items I brought online before forwarding them to me;, since most of the US companies do not make shipments to Puerto Rico. This bracelet was a way to thank her for her trouble. She was absolutely thrilled and moved for my gift. She says is very delicate and adds a very elegante touch to her essembles when goes out on an evening dinner. It's Fine quality, goes perfect with everything and my niece reports she have been receiving lots os compliments about this bracelet. This LaPreciosa tricolor sterling silver bracelet is gorgeous and very well made. This fine piece of jewelry is very unique and well priced! You’ll be sure to garner lots of compliments when you wear it! This bracelet was purchased for my 17-year-old for Christmas, and she absolutely loves it! She has not taken it off! The tricolor metal is extremely appealing because she can wear it with anything. The bracelet is delicate and not bulky, so we can be worn every day. It seems sturdy and well-made. I may have to get three or four more of these to give as gifts because it is really a fabulous piece! This is exactly what I was hoping it would be...delicate yet sturdy. I have not taken it off since I received it mid September. It is lovely and I am so glad I bought it!! very dainty. what I was looking for. 3 strands on one bracelet. The strands are so thin, one can hardly see the bracelet; The different color of each strand is barely distinguishable. Disappointed, and will not give them as gifts. Returning. Beautiful piece every woman should own! Love the necklace and bracelet set! Gorgeous with everything! Super price for the quality of product...I had never purchased jewelry from overstock, but would recommend in a heartbeat! Love this. Excellent value for the price. Very pleased with it. I love it and it is nice to wear, well made !! Worth the price!! Very nice gift! Made an excellent Christmas gift! I like the mixture of the gold, silver and rose gold. It's a very pretty bracelet that you can use for everyday or for going someplace special. Purchased as a gift. Very nice. "If the bracelet is sterling silver, what gives the other two strands their color? Is it a kind of paint? Is it electroplated? Vermeil?" "My wrist is 6 inches. Will this adjust down to 6.5 Inches?" 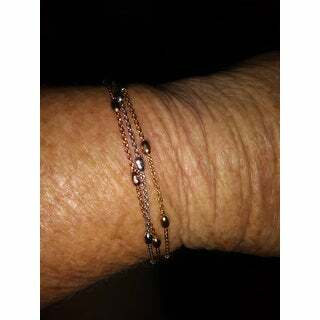 YES I also have a 6 inch wrist and wear it at the shortest length its just enough not tight but snug it has about 1 inch that hangs down and you can hook it anywhere this will work for you its very pretty. I hope this helps. "My wrist measures 7 34 inch. What is the length of the bracelet. It looks like it could be made longer"
It can be made up to 10 inches long. I love it. "To seller: Do you have a wholesale price? and where was this item made? Course Iâd like to buy in bulk and please send answer to my mail also: *** I don't visit this web often, tks. A.L." You can find the most accurate pricing on the product page. This item was made in Italy. I have been looking for a bracelet that would go with a rose, gold or silver watch. This matches all of them. Perfect! Because of the tri color and the daintiness of the bracelet. It can be worn with anything, dressy or casual.